The North Shore is set to receive its single biggest public transit improvement in decades. 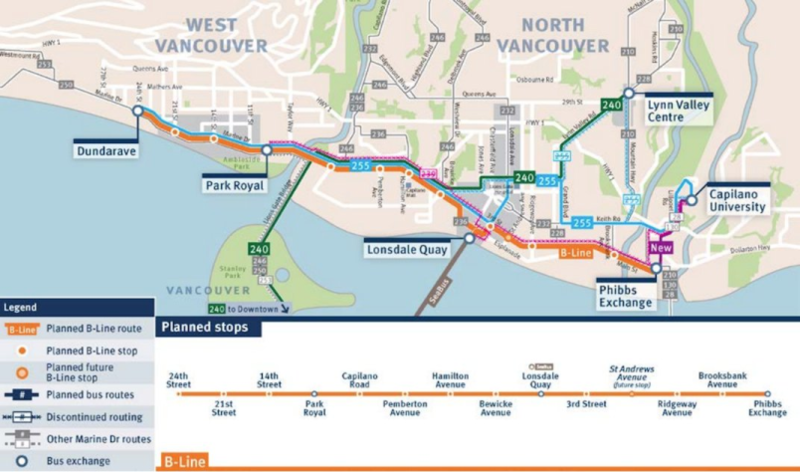 The Main-Marine B-Line will connect West Vancouver to North Vancouver, offering fast, frequent, and reliable service along a major east-west route. Running every 8 minutes at peak times, it’s a significant increase in service. While some have taken to protesting this improvement, others are looking forward to it. The B-line will benefit the entire North Shore in three key ways: it will improve mobility, reducing commute times for people living and working here; it will provide an environmentally friendly way to travel, and it will mean more customers and employees for local businesses. The North Shore is gridlocked. The rising cost of housing has meant that many people can’t afford to live where they work, greatly adding to congestion as they have no choice but to commute long distances to get to their jobs here. One of the key challenges we face is that we’ve historically built our communities in ways that prioritize the car, leaving public transit comparatively slow and inconvenient. The recent INSTPP Report affirmed the importance of good land use planning and giving people more transportation options if we’re to improve mobility on the North Shore. “We need to build complete communities that allow people to live close to where they work, while facilitating economical and effective transportation options like public transit for those who don’t,” says North Vancouver-Lonsdale MLA Bowinn Ma. Improving transit makes it a more viable alternative to driving, meaning fewer cars on the road and less traffic for those who still choose to drive, reducing trip times for both drivers and transit users. It’s a win-win. To stop the impending climate crisis, we have to ensure that people can make more sustainable choices. The scientific evidence is clear – more people taking public transit reduces energy consumption and harmful emissions. Partly in response to this, North American interest in public transportation is surging, especially among younger generations. TransLink recently saw its highest ever ridership in a single month, and Facebook groups such as NUMTOTs (New Urbanist Memes for Transit Oriented Teens) and our local spin-off ELMTOTs (Expo Line Memes for TransLink Oriented Teens) have sprung up and are calling for immediate investments in public transit. Improved transportation options are also beneficial for local businesses. Some Vancouver businesses were initially concerned about the loss of parking spaces when bike lanes on certain routes were introduced several years ago. Sound familiar? These same businesses have since realized the benefits increased mobility options bring. There’s evidence that non-drivers spend just as much in stores as drivers, and make more frequent visits. They can also have more money to spend, because they aren’t burdened with the expenses of vehicle ownership. A complete community in which people have shorter and more sustainable commutes, easier access to local shops, and where businesses are better able to find employees is good for everyone. Let’s do it. You can write in to express your support for the B-Line to the District of West Vancouver council at MayorandCouncil@westvancouver.ca.